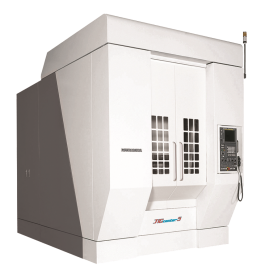 If you require ultra-high precision for high tolerance parts, Kitamura’s Jigcenter-5 Vertical Jig Boring machine offers exceptional accuracies of ±0.000039” Full Stroke, repeatability ±0.00002”. Maximum workpiece size of 32.1” x 27.8” x 23.6” allows for the machining of a greater variety of complex shapes and larger workpiece sizes. Double column bridge-type construction combined with large diameter twin ballscrews, linear scale feedback and high speed 20,000rpm spindle combine to offer the highest levels of accuracy and rigidity for more sophisticated, high-profit work. Tool Change Time (T-T/C-C):2.5 Sec. /5.0 Sec.